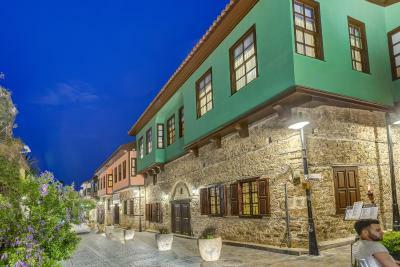 Lock in a great price for Kaucuk Hotel – rated 8.9 by recent guests! 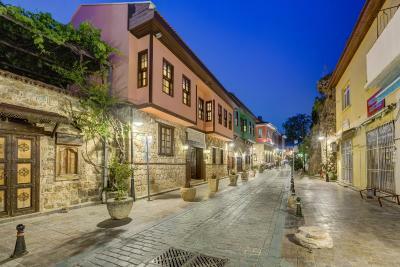 The Kaucuk is easy to find, which is saying something when it is easy to get lost in the Kaleici's maze of streets. The courtyard is beautiful, but still catches the sun. 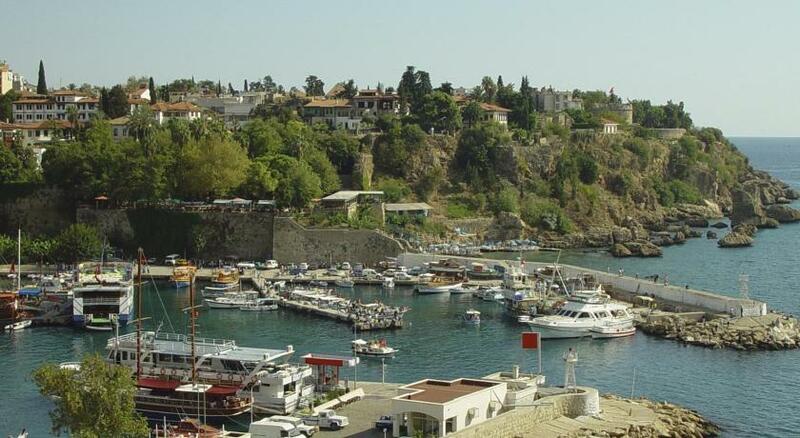 The hotel is also just a short walk from Mermerli beach, as well as all the parks and attractions of central Antalya. The owners and staff are very helpful and friendly. The Kaleici is a wonderful place to stay - sometimes so quiet you can explore to your heart's content; but on Saturday nights the whole world in all its diversity descends and has a party. What a delightful experience! 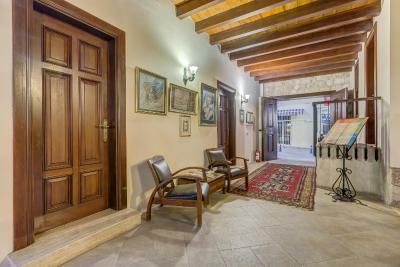 Gorgeous property in the heart of Old Town, with spotlessly clean and tastefully decorated rooms each with their own name and story of how they were named. Breakfast was out of this world, in addition to the eggs made to order, a huge selection of homemade delicious goodies, fruits and Turkish olives, cheese, bread, etc. 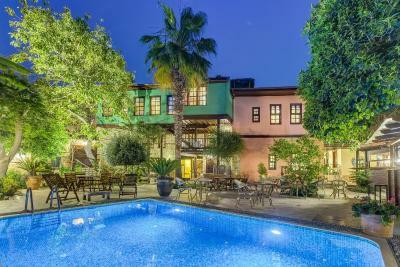 The property is owned by a well-traveled, delightful Turkish couple with vast knowledge of the area. Perfect English is spoken and they treat you like family. Sad to go after only one night but coming back with a group of friends next year! Beautiful hotel in stunning setting. Room was perfect with feature walls and ample space. Breakfast area was also special with glass bottom floors on to ancient ruins with contemporary Turkish art on walls. Staff friendly and welcoming. Couldn't recommend more. The comfort, the surroundings and the lovely staff and owner made this a very special holiday. Rengin tailors the service to the guest's wishes; she really listens. 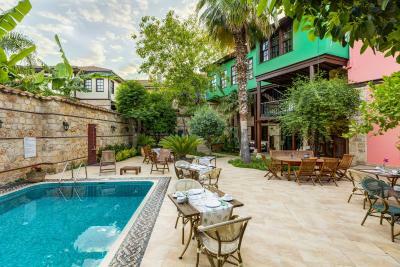 She is as friendly or discreet as you like, treats her staff nicely and the rooms are spacious and spotlessly clean with lovely crisp Turkish cotton sheets. 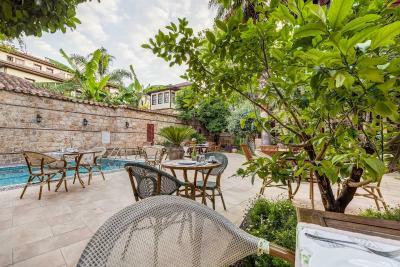 This is a beautiful boutique hotel positioned in a wonderful corner of the antique quarters or Antalya. Finally, the food is five star, in fact much better than 5 star all beautifully cooked for you as an individual with the freshest and finest ingredients. I particularly recommend the Shrimp Stew! Such a welcoming hotel offering tranquillity from the hustle & bustle. Čisto je i uredno. Osoblje je prijatno i uslužno. Ambijent u bašti je prelep. очень аутентично - красивые детали интерьера , настроение старины..
Struttura pulita ed elegante. Staff gentilissimo e disponibile ad ogni nostra richiesta. La camera è super confortevole, ottimo letto bagno spazioso ed una doccia spaziosa. 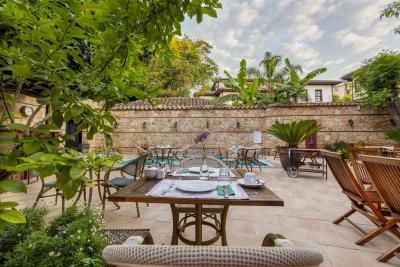 Featuring 2 restored historical mansions, Kauçuk Hotel is located in the heart of Antalya, in the Old Town district. 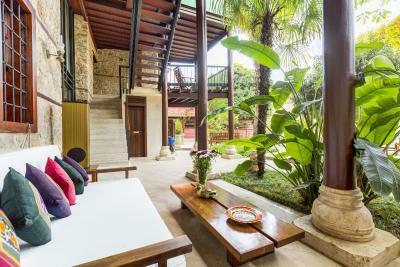 It offers spacious rooms with unique designs, Turkish style and garden views. Mermerli Beach is 800 feet away. 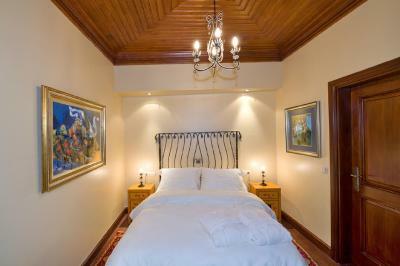 Each air-conditioned room is decorated with antique Anatolian rugs and original Turkish contemporary paintings. They all have a marble bathroom with showers, slippers and bathrobes. All beds in rooms are made of hypoallergenic and antibacterial materials and are fully-orthopedic at the same time. Free WiFi is available throughout the hotel. In the morning, Kaucuk’s restaurant serves a traditional Turkish breakfast with fresh fruits and vegetables. 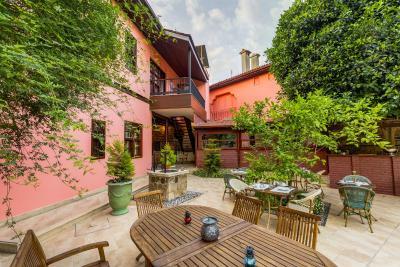 You can have your breakfast and dinner at the on-site art gallery housing contemporary Turkish artists' works. The à la carte restaurant offers meals from Mediterranean cuisine and Chinese breakfast is available. Nearly all ingredients used in the cuisine are seasonal, fresh and organically grown in the nearby villages. Musical accompaniment, composed of a small violin orchestra, is available upon request. Guests can sunbathe on the loungers or swim in the outdoor pool or Mermerli beach which is a 2-minute walk away. Beach towels are available. Smoking is not allowed in the rooms and in any indoor areas of the hotel. Kauçuk Residence has an art gallery which is located on archaeological findings. Guests can observe the objects of Hellenistic period as well as Turkish contemporary art while dining. Transfers to Antalya Airport can be arranged upon request and against a surcharge. 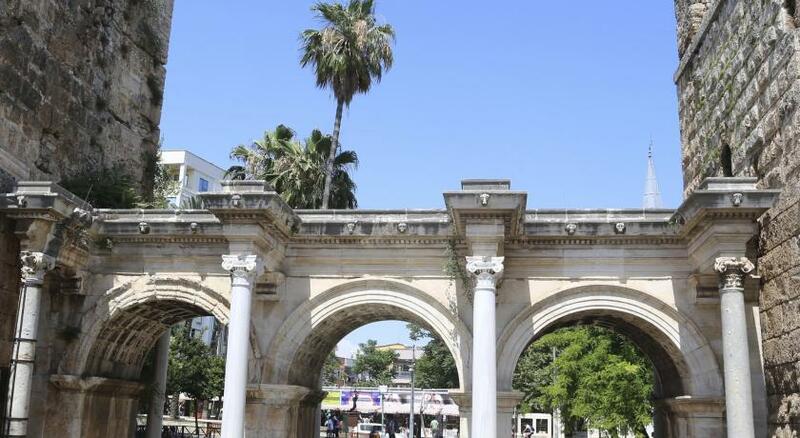 Kauçuk is only a 2-minute walk from the historical clock tower and a 20-minute walk from the Antalya Archaeological Museum. 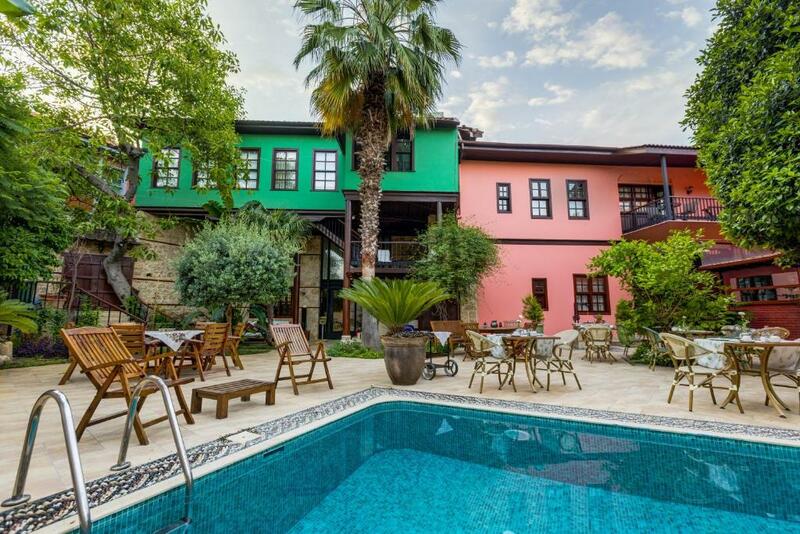 When would you like to stay at Kaucuk Hotel? 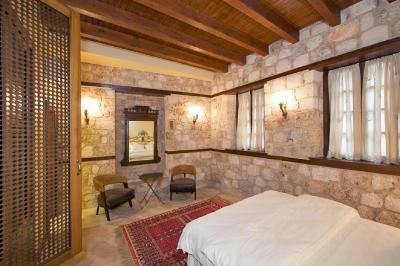 This room is located on the first floor facing the monumental landmark of old city and the street. 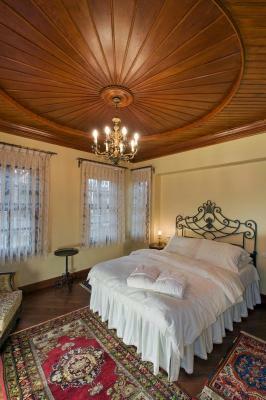 The room features hand-crafted wood ceiling, an antique cut glass & brass chandelier and parquet floor. Also custom made brass bedheads dressed with pure cotton linen are offered in the room. There is sun blackout blinds topped with lace curtains. In the room original contemporary paintings by Turkish artists and antique Turkish rugs are exhibited. The room opens up to the lounge area. This room is located on the first floor facing the garden and the pool. The room features hand-crafted wood ceiling and parquet floor. 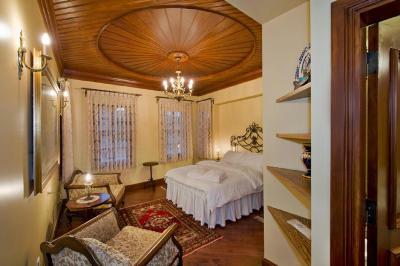 Besides handmade glass chandelier and side lamps, brass bedheads dressed with pure cotton linen are offered in the room. Windows are dressed with sun blackout blinds with lace curtains. In the room, cabinet doors are decorated with stylish stained glass. 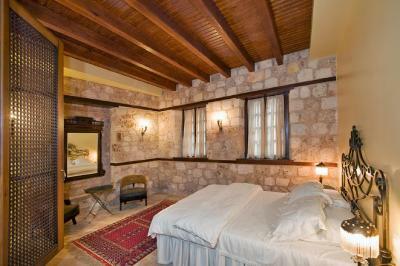 This room is located on the first floor facing the monumental landmark of old city and the street. The room features hand-crafted wood ceiling, an antique brass chandelier and parquet floor. Also custom-made brass bedheads dressed with pure cotton linen are offered in the room. There is sun blackout blinds topped with lace curtains. In the room original contemporary paintings by Turkish artists and antique Turkish rugs are exhibited. 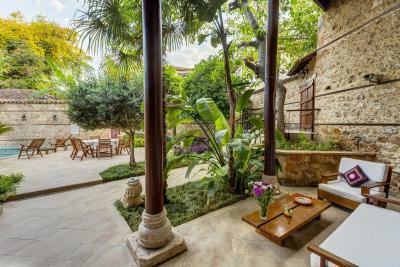 This room is located on the garden floor facing the monumental landmark of old city and the street. 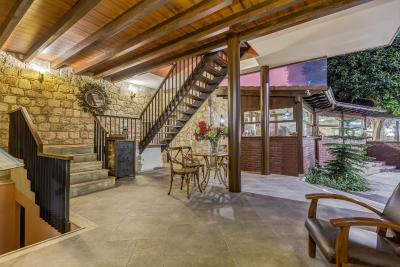 The room features hand-crafted wood ceiling, stone walls and tiled floor. Also custom-made brass side lamps, brass bedheads dressed with pure cotton linen are offered in the room. Windows are dressed with embroidered curtains. The room has a large bath room. In the room, original contemporary paintings by Turkish artists and antique Turkish rugs are exhibited. The room opens up to the courtyard. 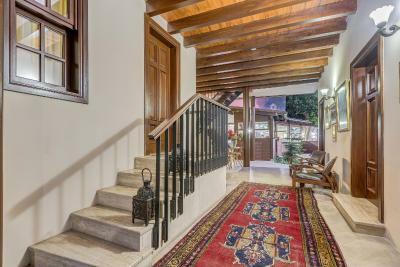 This room is located on the garden floor facing the monumental landmark of old city and the street. The room features hand-crafted wood ceiling, stone walls and tiled floor. Also customs made brass side lamps, brass bedheads dressed with pure cotton linen are offered in the room. Windows are dressed with embroidered curtains. In the room original contemporary paintings by Turkish artists and antique Turkish rugs are exhibited. The room opens up to the garden. 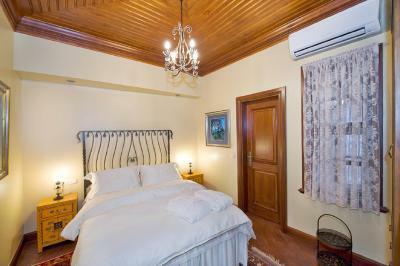 This double room features a private entrance, mini-bar and air conditioning. This room is located on the first floor facing the balcony. The room features hand-crafted wood ceiling and parquet floor. Besides handmade glass chandelier and side brass bedheads dressed with pure cotton linen are offered in the room. Windows are set with lace curtains. In the room, cabinet doors are decorated with stylish stained glass. This room is located on the first floor facing the old town street . 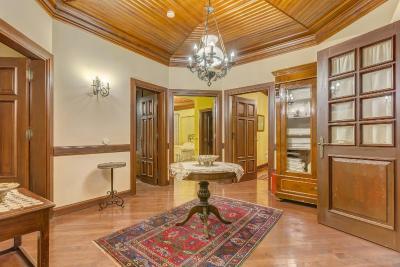 The room features hand-crafted wood ceiling and parquet floor. 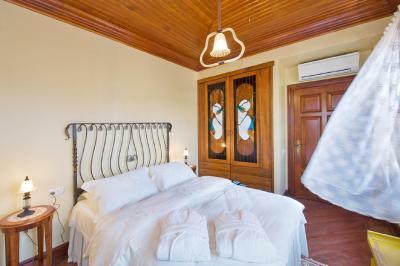 Besides glass chandelier and side lamps, pure cotton linen bed textile are offered in the room. Windows are set with lace curtains. 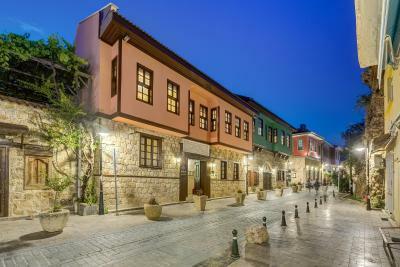 Kauçuk is a very special place since the hotel represents a unique sample of Ottoman houses by fine architecture and preserves an archeological site.The dining room is positioned on the top of 2300 years old archeological findings. House Rules Kaucuk Hotel takes special requests – add in the next step! Kaucuk Hotel accepts these cards and reserves the right to temporarily hold an amount prior to arrival. Please note that smoking is not allowed in the rooms and in any indoor areas of the hotel. Children under 12 years old cannot be accommodated at this property. 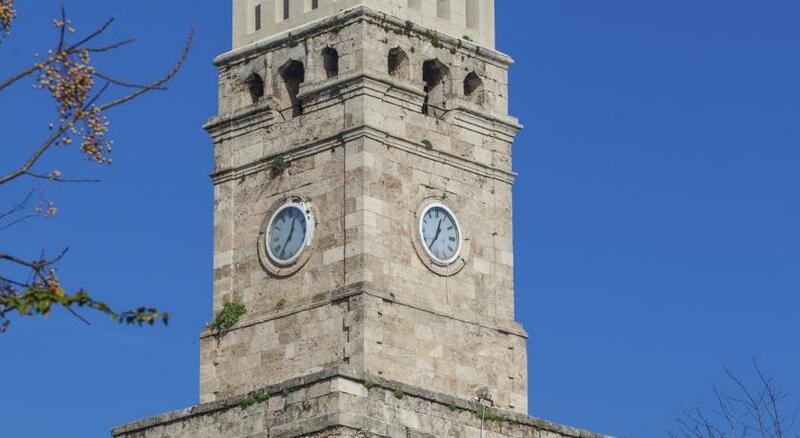 Please inform Kaucuk Hotel of your expected arrival time in advance. You can use the Special Requests box when booking, or contact the property directly using the contact details in your confirmation. The room booked had a symbol for and word 'patio'. It doesn't - there is no private outside space, just the communal courtyard area. The room was also rather cramped and dark. Upgraded for last two days to upstairs room with shared balcony, both of which were lovely, but cost extra of course.